I received a letter this morning from a reader of my blog who wishes to remain anonymous. She had been told that Hitler was a vegetarian, and wondered if it was true. I did a bit of research and found this very interesting letter from Rynn Berry, Historial Advisor to the North American Vegetarian Society. “To the Editor: I must take issue with Mr. Rothstein’s glib characterization of Hitler and his Nazi henchmen, Hess, and Himmler, as vegetarians, in his review of Tristram Stuart’s The Bloodless Revolution (February 25). As the historical advisor to the North American Vegetarian Society, I am constantly being taxed with having to explain Hitler’s alleged vegetarianism. 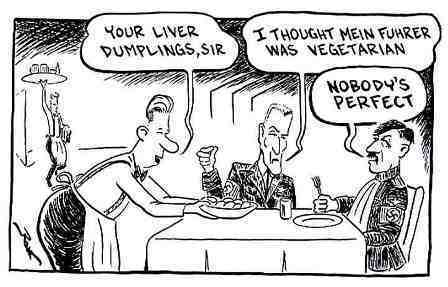 In researching the matter, I discovered that Hitler was not a true vegetarian. I presented my findings in a book entitled Hitler – Neither Vegetarian Nor Animal Lover (Pythagorean Publishers, 2004). To be sure, Hitler professed to be a vegetarian (in section 66 of Hitler’s Table Talk, 1941-44), but the primary sources that I have cited in my book show that while he paid lip service to vegetarianism, he was not consistent in his practice of the diet. “Vegetarian” – which means, (according to the standard dictionary definition) “the practice of eating only vegetables and refraining from eating meat, fish, or other animal products” – is like that other V word, Virgin: you either are one, or you are not. By that criterion, Hitler was a quasi vegetarian, a would-be vegetarian, or a flexitarian. He was decidedly not a true vegetarian. With regard to Rudolf Hess, the Fuhrer’s fawning deputy, Hess may have been a vegetarian for a brief space – perhaps as a result of his faddish interest in Rudolf Steiner’s bio-dynamic agricultural theories. Mr. Rothstein’s statement that Heinrich Himmler, the architect of the Final Solution, was a vegetarian advocate [“Himmler was an advocate,”] is preposterous and utterly without foundation in fact. Finally, to suggest with Tristram Stuart, as Mr. Rothstein does, that many Nazis were vegetarians, [“Many Nazis, as Stuart suggests were either vegetarians or interested in related issues.”] is a gross distortion of the facts. The truth is that not one Nazi was a thoroughgoing vegetarian – not even Hitler himself.